iPad Arrival is it Make or Break Time for Australian Newspapers? Whilst Apple continues to play with the launch date of the new iPad, (moved from 28 May to early June now just June) ; newspapers around the globe, and old media have a vested interest in reporting on the new iPad. It is their strong belief that the iPad might be the last hope of many a newspaper. The Herald Sun newspaper of Australia typifies the desperation. Speaking to James C a reporter with the rag, when asking about the iPad, seemed to almost have a tear in his voice when he asked if I thought the iPad would save the newspaper industry. The herald sun has fallen on hard times like many newspapers. They still report on circulation numbers today that are 5 years old. Unfortunately many newspapers like the Herald Sun have refused to embrace new technology and live in the past. A mistake many US newspapers learned the hard way years ago. 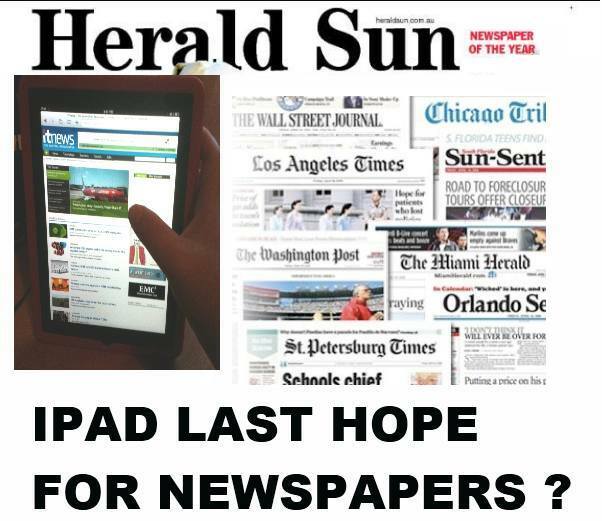 The herald sun plans to introduce technology soon (a new apple app) that will allow the new Apple iPad to view the newspaper online. They seem to be unaware; this technology could have benefited them years ago when the first Apple iPhones and other ‘smart-phones’ were introduced. This is worsened still when very little technology is reported in Australia by Australian reporters. Reporters and Newspapers often seem bewildered when explained that newspapers online have a circulation potential much bigger and much wider then they had before. If nothing else the demographic of those that will read a newspaper online is very different and should be treated as such with the content and advertising they receive. One fellow Australian reporter seemed amazed at the knowledge that someone in Australia would look at US newspapers online, or someone outside Australia would look at an Australian newspaper. A fact few newspapers have managed to benefit from financially. Some papers like the New York Times USA and ITnews Australia do understand and have embraced technology a long time ago. Ironically the herald sun ran a video article about the iPad on Sunday 23 May 2010 with a reporter James C in Fed Square, Melbourne. Unfortunately the video uses Adobe Flash the online format the iPad, iPhone and others cannot use. If newspapers are going to survive online they are going to need to understand the technologies they expect to save them.